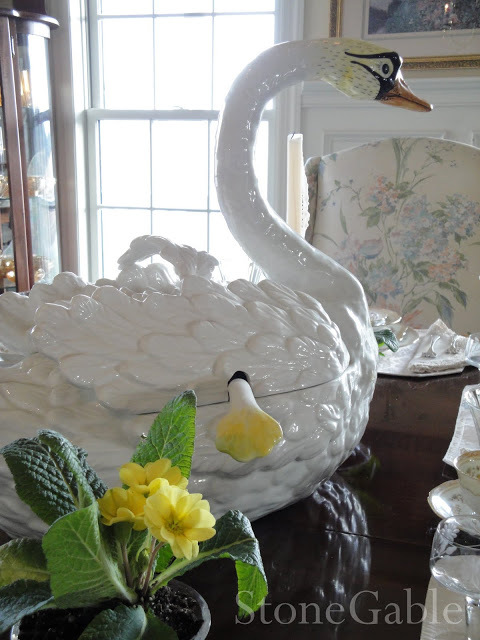 This swan soup tureen sits on my dinning room table all year ’round. Rarely do I use it as a centerpiece in a tablescape, but it is really center stage worthy. 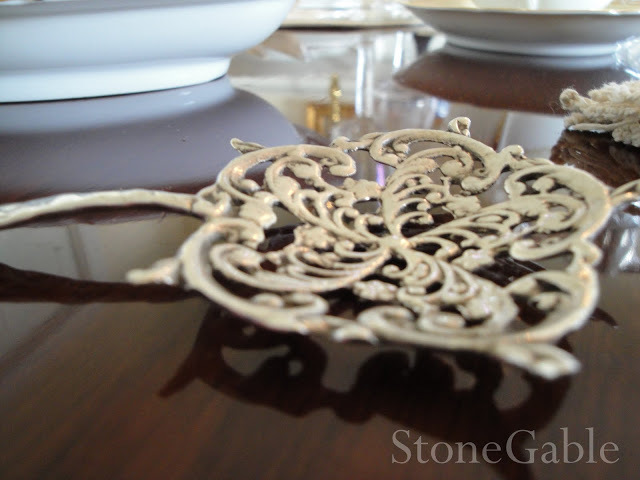 Today’s table is formal… using very old and traditional elements. Quiet colors reign against a dark table. I wanted this table to speak of the past, because these adornments have been collected for ages and some are almost 100 years old. I am so comfortable in a style that is a marriage of the past and present. A collected feel is how I would describe it. 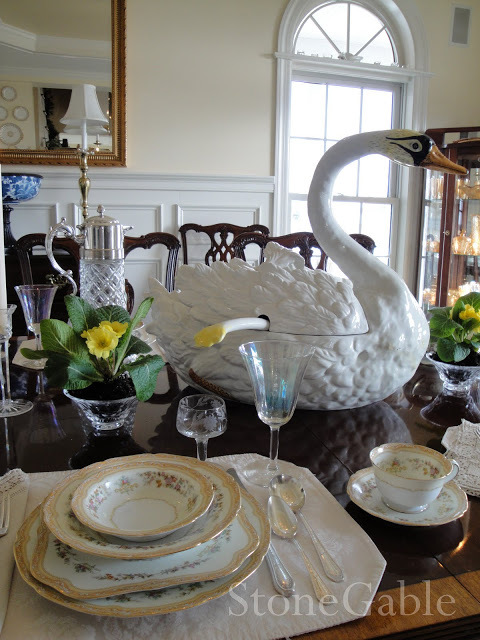 The inspiration for the table was not the swan but the antique cut crystal and silver coffee carafe (or wine) my daughter and son-in-law gave me for Christmas. 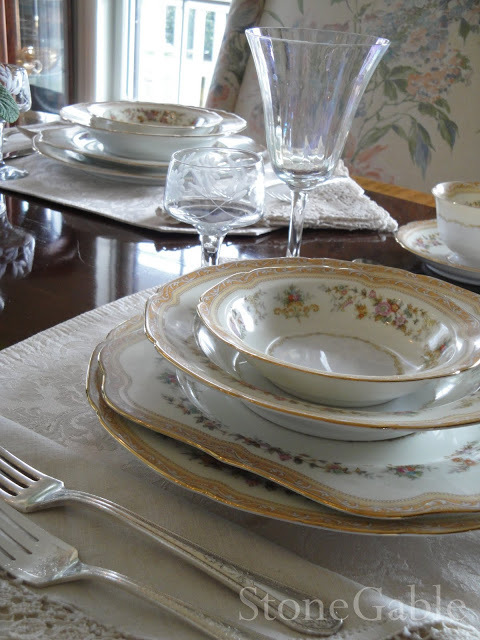 I also decided to dig out my Noritake “M” porcelain china. I purchased this 14 years ago just before we moved into our present home. I found this set in a local antique store. 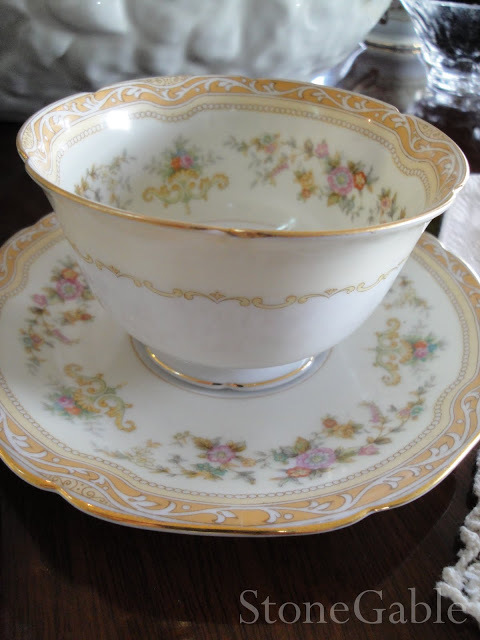 I am not sure what the pattern is, but with some brief investigation, it was made by Noritake anywhere from 1914-1940ish. I love yellow and wanted to use it in my built in hutch. The colors are very light and like a gentle whisper of a yellow. 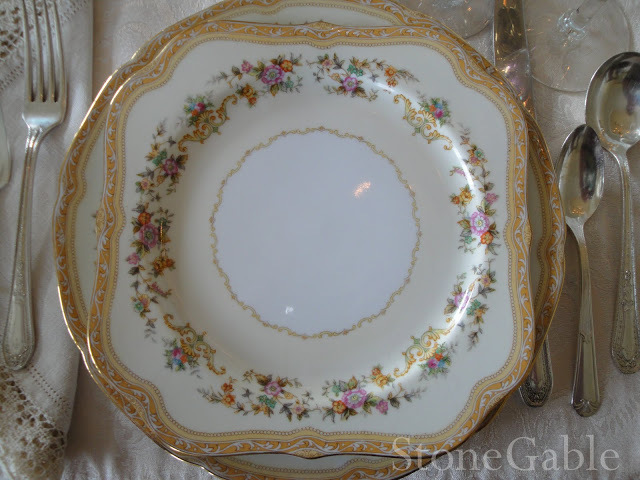 The china has a hand painted gold scallopped edge around the rim. I am particularly fond of the square salad/dessert plates. Square dishes are not a new phenomenon after all! 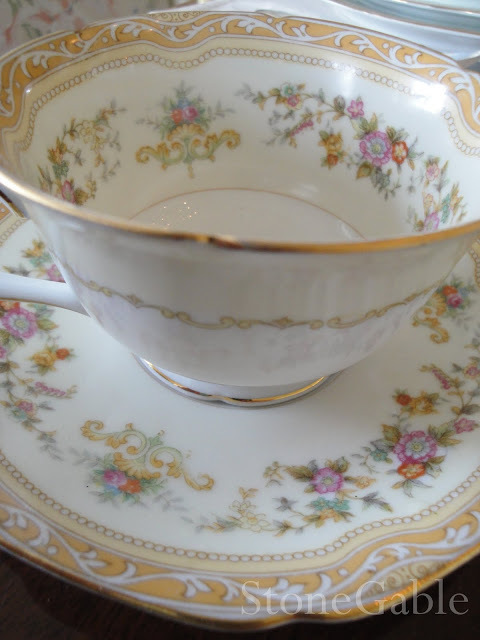 When I first saw this china it was the cup and saucer that captivated me! I knew I wanted to have a cup of hot something from it. I thought they were so beautiful and delicate. The detail inside the cups gave them such quiet importance. I also loved the lines of the sugar bowl and creamer. These were not just auxillary pieces, they commanded to be noticed. I am using a sterling silver sugar spoon my mother-in-law gave me as a gift many years ago. No tablecloth for today’s tablescape- I wanted the beautiful mahogany wood to continue the traditional feel. 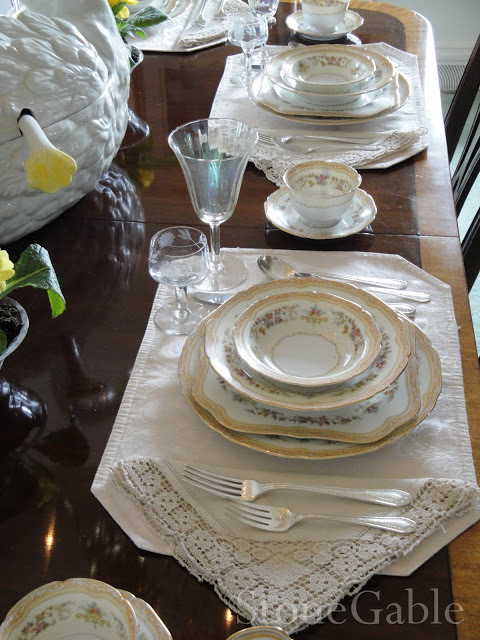 Ivory damask placemats and antique linen and ivory cotton lace napkins add texture and softness to the table. 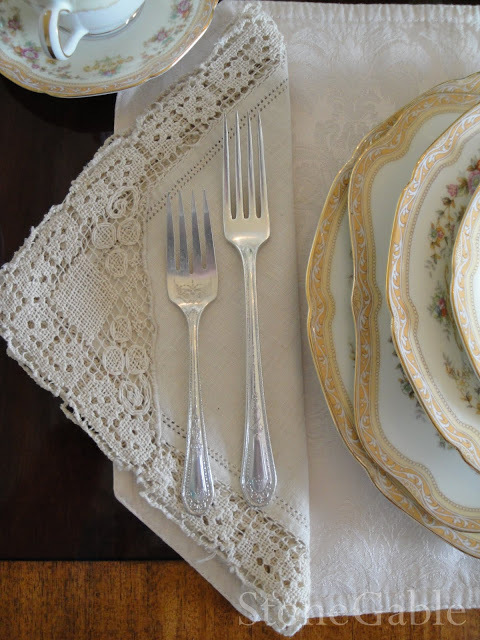 The detail in the lace and the napkin itself is lovely. Simply folded napkins show off the detail best. 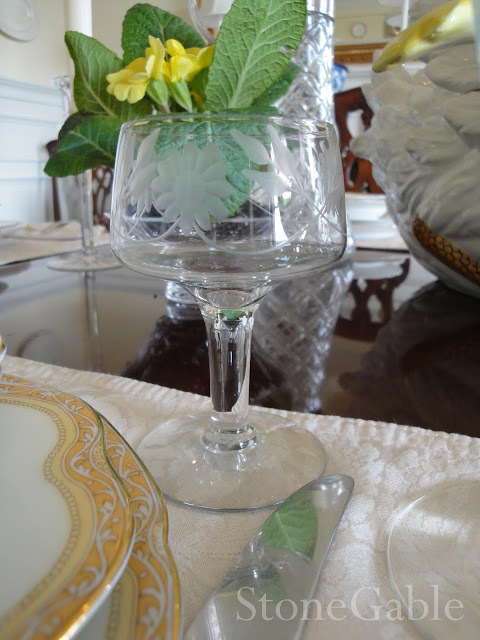 The tall stemware were passed down to me from my Grandmother. They were her wedding crystal. 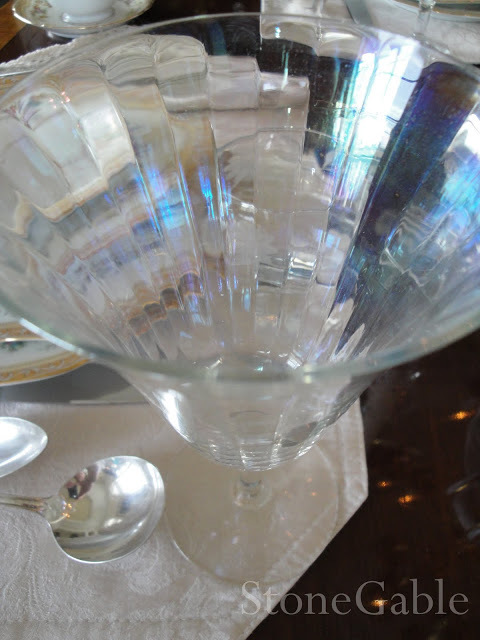 Fluted and slightly iridescent, very reminiscent of the early 1920’s, Nani’s glasses grace another table 70 years later. I use and enjoy my beloved things. The little cordial glasses were a Goodwill find. I paid $3.00 for all of them! 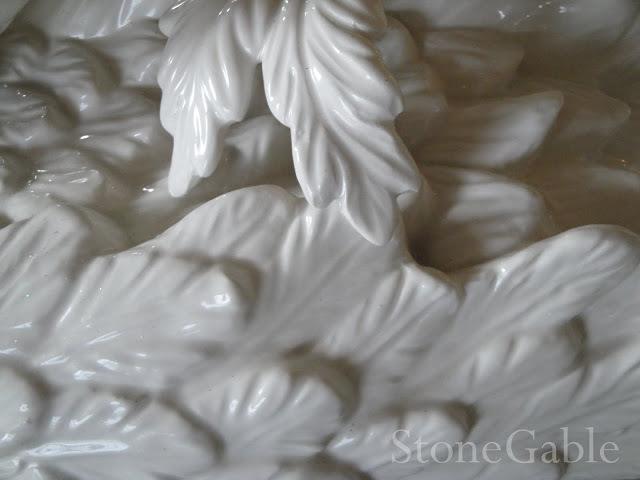 They are etched with a floral design and I thought they would be very pretty on this table. Can you imagine my surprise when I opened this beauty on Christmas morning? Heavy and detailed, what a magnificent and thoughtful piece! My daughter, Jacqueline and her husband Jonathan found it in a Washington DC antique shop. It was waiting for me!!!! Uncluttered and understated, I wanted the elements in this tablescape to shine. I wanted the formality and elegance to come from fine pieces simply put together. With my china I have many serving pieces. 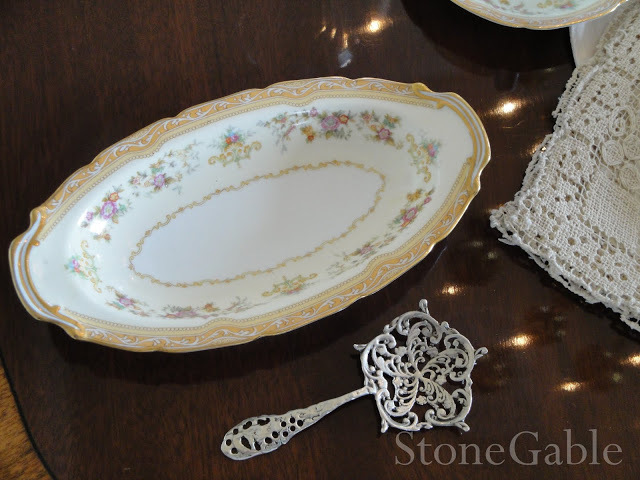 A small dish and an ornate silver spoon finds a place on a corner of the table. 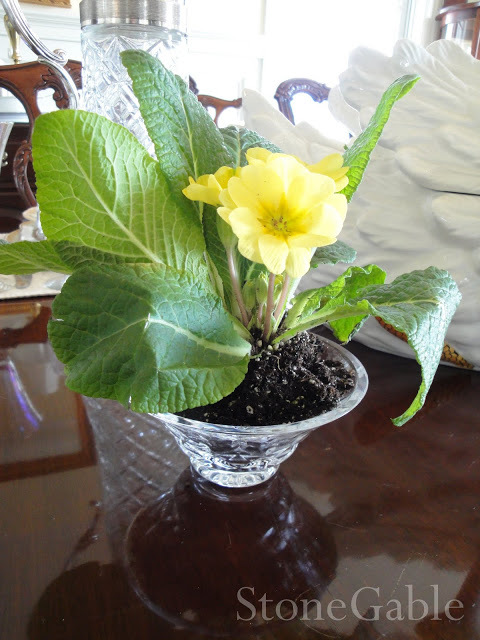 Yellow Primroses in Waterford bowls add a splash of color to an otherwise soft color palate. I couldn’t resist these little harbinger’s of spring in the dead of winter! 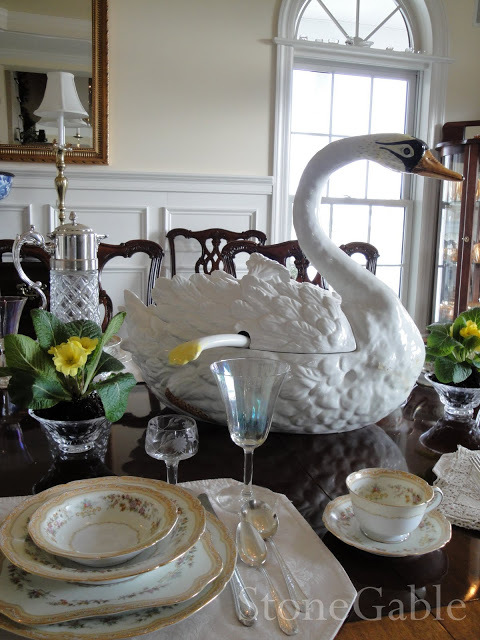 The Swan was a purchase from a shop in Alexanderia, Virginia just after we built our present home. Graceful and stately, I must admit it is one of my favorite things! 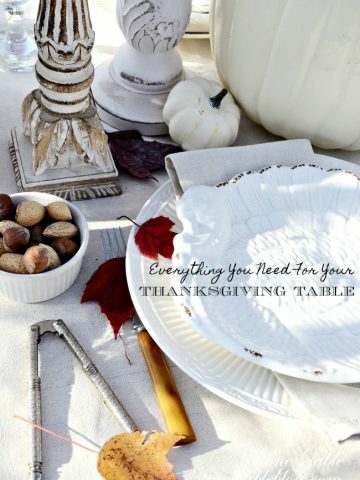 This tablescape was a joy to create because it displays some of the pieces I love the most. Collected or gifted, these treasures of the heart are filled with memories. 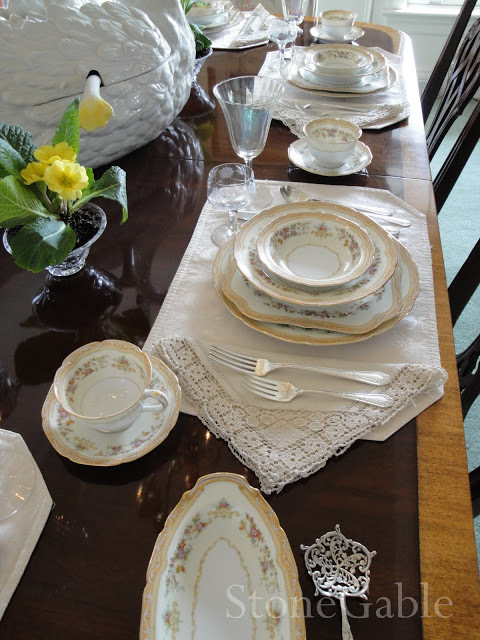 I am participating in Tablescape Thursday hosted by Susan at Between Naps On The Porch. Don’t miss seeing all the creativity! 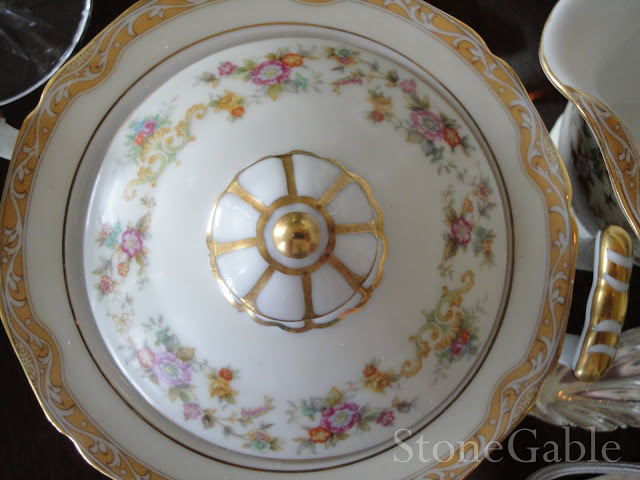 There is a beautiful companion serving dish listed on Ebay, I think I saw it at estatetreasures_and_consign. That’s a stunning tablescape! 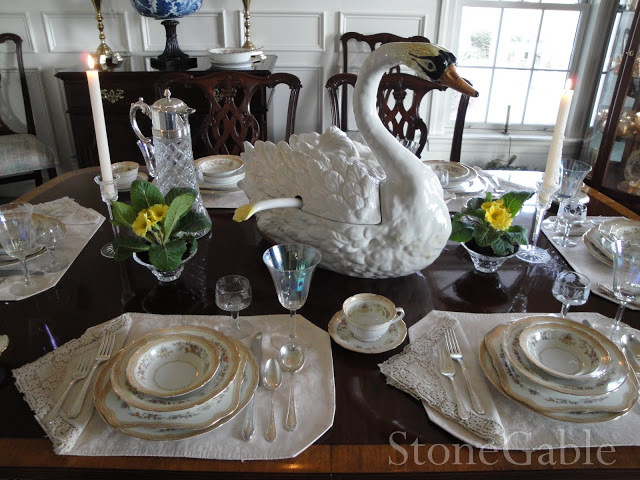 That swan tureen is a showstopper! I’ve never seen one before. I love those beautiful napkins also. What a beautifully elegant table! 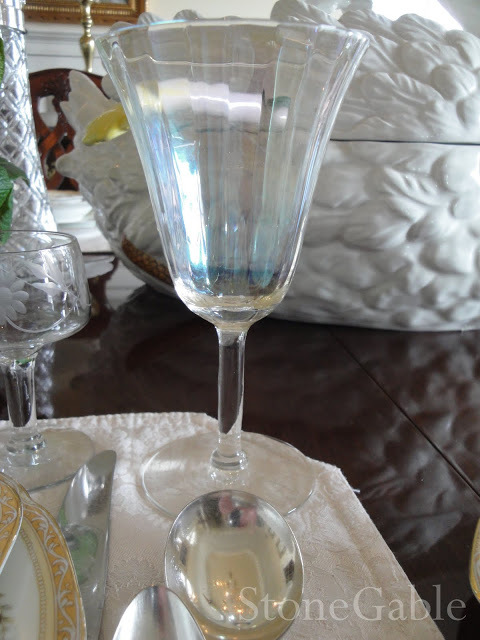 I’m in love with your iridescent stemware…and your china…and the swan. Just a simply stunning table. I simply enjoyed every ity bitty detail about this tablescape. It’s like I was a sponge soaking it all in. 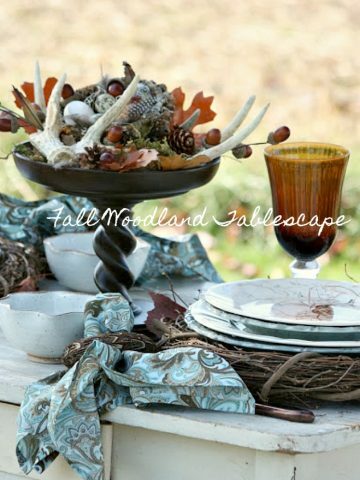 You have a new follower with me too, as I love tablescapes. Easy to see you excel! Yvonne…I am left speechless! Your table is beautiful. 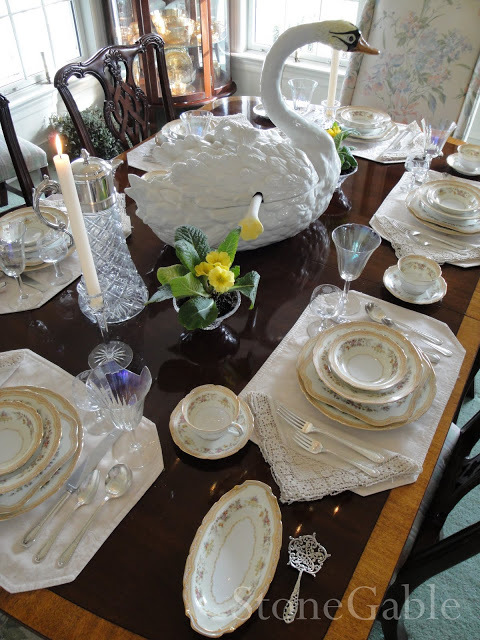 My MIL loved and collected swans and would have just been in awe of your beautiful tureen. I love your *collected feel*! Oh my word, this is stunning. In fact I would expect to see this tablescape show up on the front of a beautiful magazine. Your attention to detail along with your beautiful family treasures are inspiring to me to get out there any do more collecting. I have come to appreciate beautiful china and glassware a little later than most so I’m playing catch up now. Breathtaking! That swan is magnificent! You must have a special place to display him when he’s not sitting on your table. He is so big! The coffee carafe is gorgeous and what a wonderful gift! 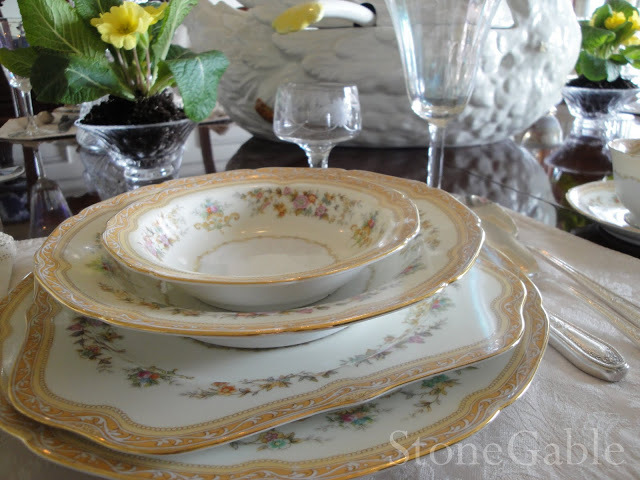 I really like the feeling of “spring in winter” your tablescape gives with the flowers and the china pattern. Another fabulous ‘scape! Could I please just come and sit in your home for a while? A seat at the table would be great, but I bet I could find a dozen other places to sit that would be equally relaxing and nourishing to the soul. This is just gorgeous. Boy you have some lovely pieces. I love all the crystal and silver! Beautiful! Your tables are always so stunning…as I have said before, you have the most beautiful and unique items. 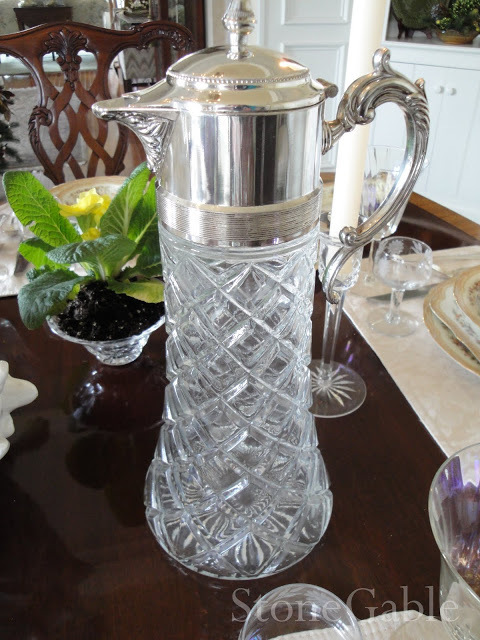 I love that crystal and silver carafe…I hope you gave them a big hug for that gift, gorgeous. 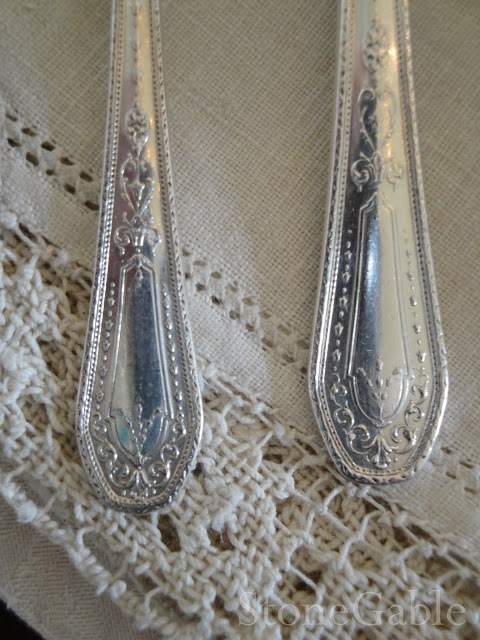 I love the silver serving spoon…that cutwork is beautiful. I’m going to go back and look again…hope I don’t drool all over your beautiful table. I’ll try to adjust my bib first. Wow, your table is simply breathtaking! 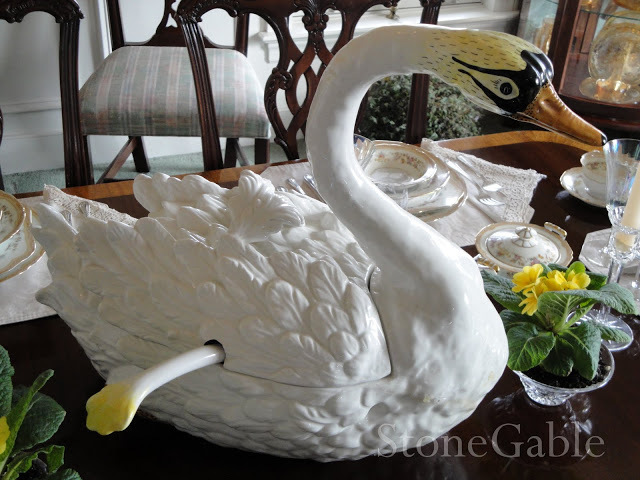 Everything looks lovely and your swan and carafe…amazing. Thank you for letting us have a peek into your beautiful home. 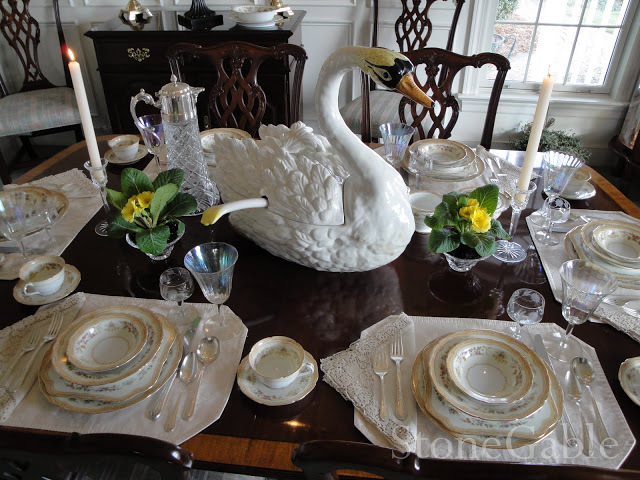 Gorgeous table, that swan is so regal! 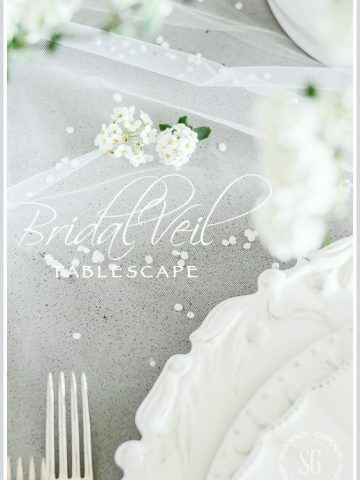 I am so enjoying just looking at everyone else’s table scapes this week, inspiring! Everything is just beautiful ! And your pics are great ! Oh, my…this is just stunning. Your dishes are so elegant and I love all the stemware. 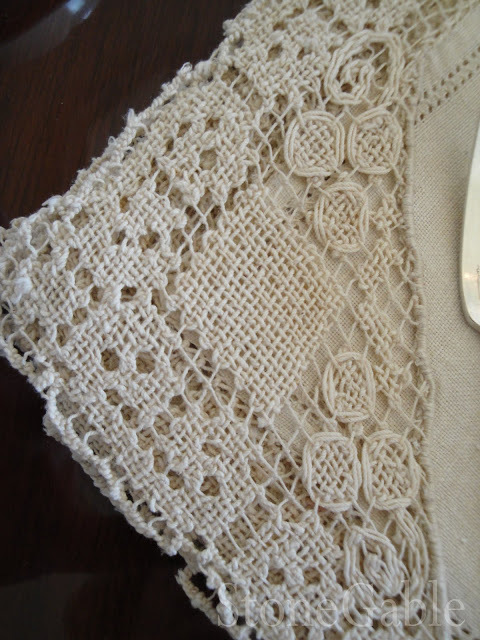 Just beautiful..
My maternal grandmother had a Nortiake pattern that I adored. One of my nieces has it. It’s green and yellow, and it is one of the prettiest patterns I’ve ever seen with all sorts of pieces… just like this one! Yours is truly stunning, and I love the square plates. 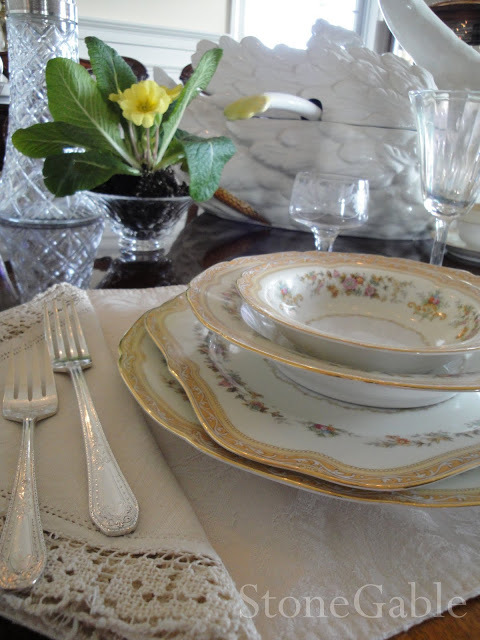 It must just thrill you beyond words to set the table with this gorgeous set. 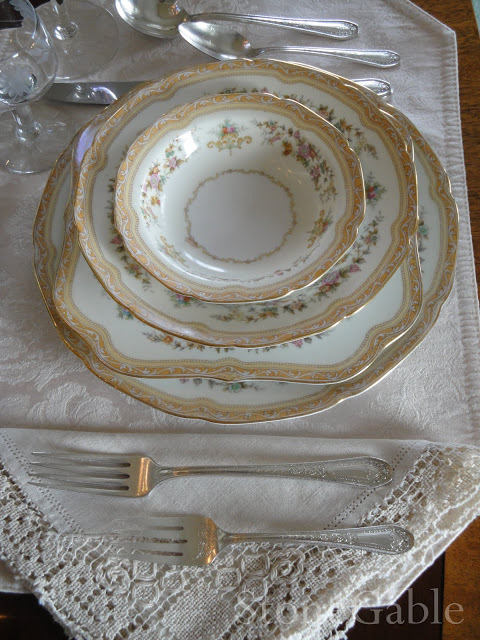 I have a few pieces left of my paternal grandmother’s Haviland and her mother’s Bernardaud, and I cherish them, too. Don’t you love to use these treasures on your table? 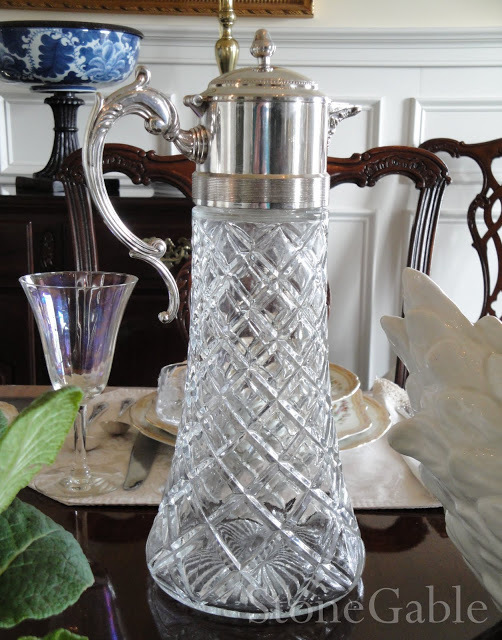 That crystal carafe no doubt made your Christmas. What a thoughtful and beautiful gift from someone you love so and who obviously loves their Mama! 🙂 I would hesitate to put hot coffee in there in fear it would crack. I wonder if it was used for show only??? I think I would probably do something like orange juice because I’m a chicken when it comes to crystal. Mr. Magpie’s sister put ice in a pitcher of my MIL’s that had a large crack on the outside, and the whole thing cracked sending ice water everywhere and scaring poor SIL nearly to death. That was five minutes before my MIL’s birthday party this summer, with guests already pulling up outside. You can imagine! Thank you for sharing this table with us, and in turn, I am sending you a round of applause and wishing you a very Happy New Year! A stunning tablescape. Your china is beautiful as well as everything else. Just gorgeous. enjoyed all your lovely pics. Beautiful table. 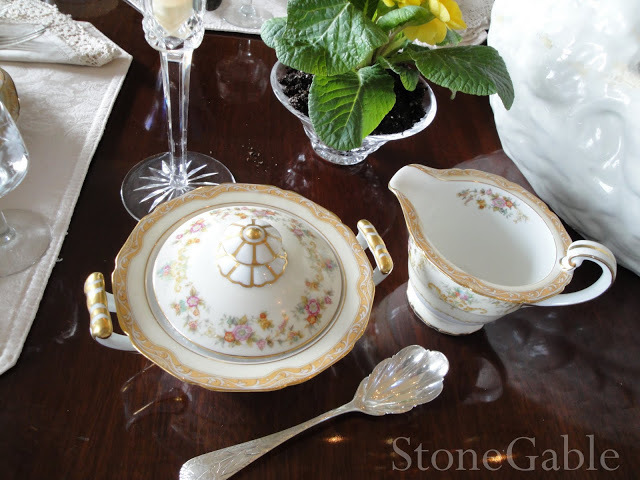 Love the pretty swan tureen, and the gorgeous china. And I love yellow as well. Thank for sharing it with all of us. Gorgeous!!!!! What more can I say!? Hello Yvonne~ ~It’s so nice to meet you. 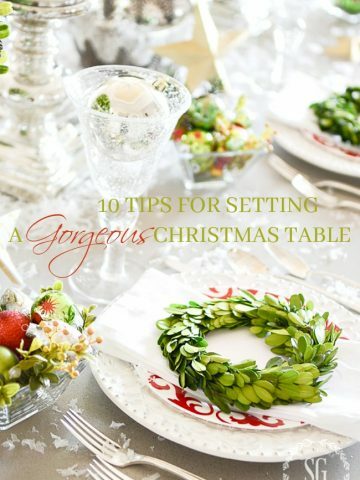 I can see that you are a hostess with lots of style, your table is stunning. Every little detail is thought out. That swan is amazing! Did you get her locally? If so I will run right out and get one. I am so happy to have found you please stop by and see my location. Too funny. You china is lovely. I too love yellow and it is difficult to find yellow china and dishes. I was shocked to see the square plates in the set of that age? I’ve not seen that before. Looks like we have lots in common. What a feast for the eyes. Every where I look is another beautiful image! 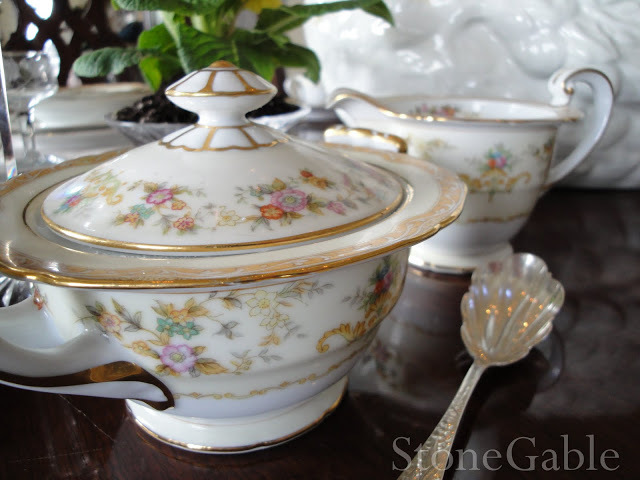 That tureen is to die for, and so is the antique coffee/wine thingy – who cares what it is, it’s stunning! And don’t even get me started on that china – wow! What a stunning table you have created, formal and yet very welcoming. 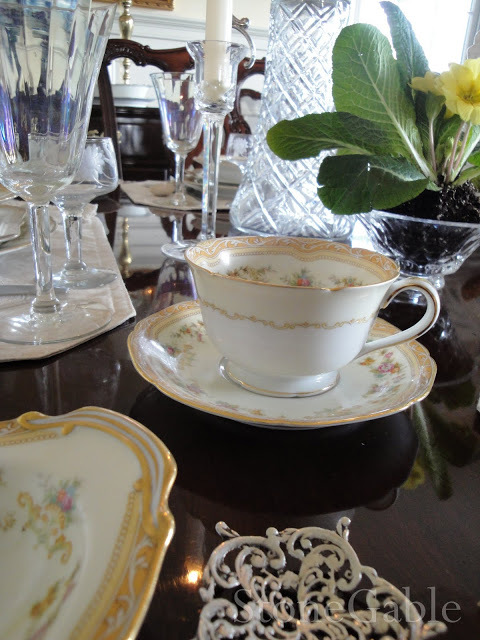 I love the vintage china & antique silverware that you have collected over the years, the stories behind your inherited family treasures adds a special lustre to it all. It was so sweet of you to say you were inspired by my post but I know you will blow me out of the water! LOL it gives me something to aspire too (when I’m rich) Wait, am I an heiress to something??? My maiden name was Campbell,,,how much is that worth? Mama needs some dishes! Seriously, I love your posts and your visits mean alot to me! I want to be you when I grow up! Amazing. I love that you posted so many photos. It was fun to look at all the details. Very elegant table with all of those memories! The gift from your daughter just shows that she too has inherited the exquisite style and taste that has quite obviously been in your family for generations. Kathy. Yvonne, what can I say other than S.T.U.N.N.I.N.G…from the beautiful china, to the crystal, to that exquisite carafe, to the linens, to the gorgeous swan tureen…just stunning! Thank you for sharing. Wow! You must have been jumping up and down when you opened that gift! It is beautiful. The entire table is gorgeous…mine this week could be called just the opposite! Everything looks so pretty…planting flowers in Waterford, oh my! Hi Yvonne! Oh this is such a lovely table. Your beautiful swan is breathtaking! Love it all!! That is the prettiest soup tureen I’ve ever seen! The yellow china so lovely, yellow is my favorite color so I really like it! 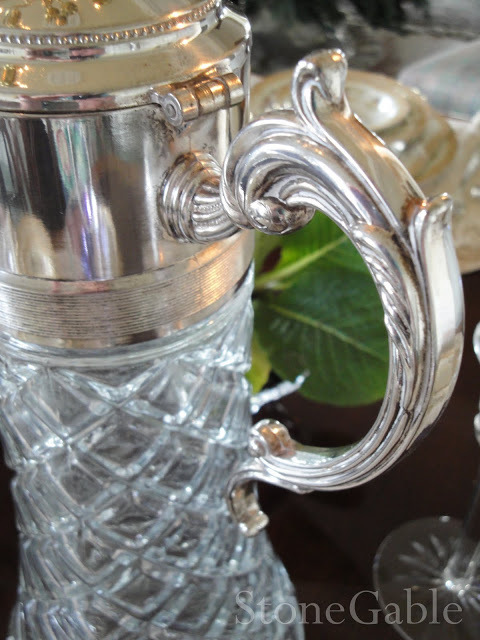 The crystal carafe is to die for! What a wonderful gift! You have so many gorgeous things! Love the chairs as well! Oh, how elegant. I ate this up like candy and went back for more. 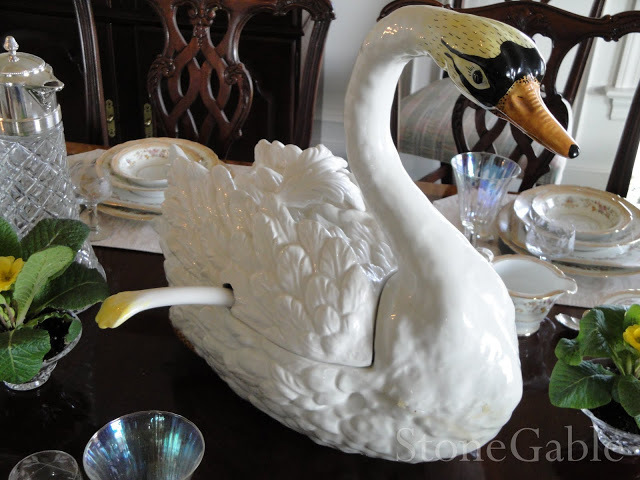 The swan is the most gorgeous tureen of all time. I absolutely love your dishes, dining room, and most of all your style. Oh your swan is stunning! This table is simply beautiful. 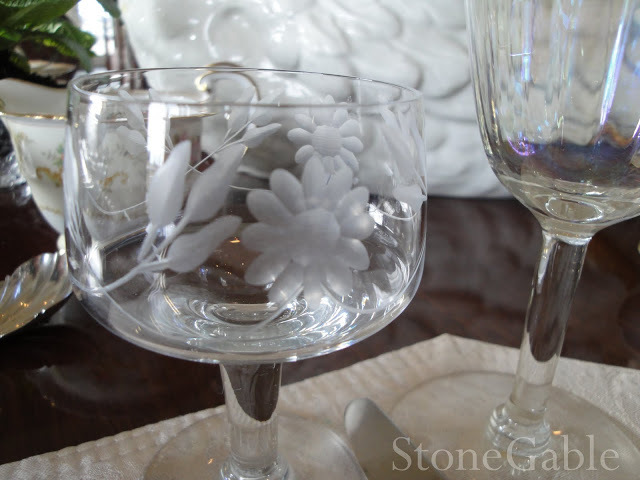 I love your vintage linens and the stemware — everything is lovely and soothing. A very beautiful table. The swan is absolutely perfect! And I love your dishes! Beautiful table..The dishes are wonderful, I too am surprised about the square dishes..just lovely..
And the swan, is delightful. I can see why you would leave this on display in your dining room ! Gorgeous! Just beautiful. 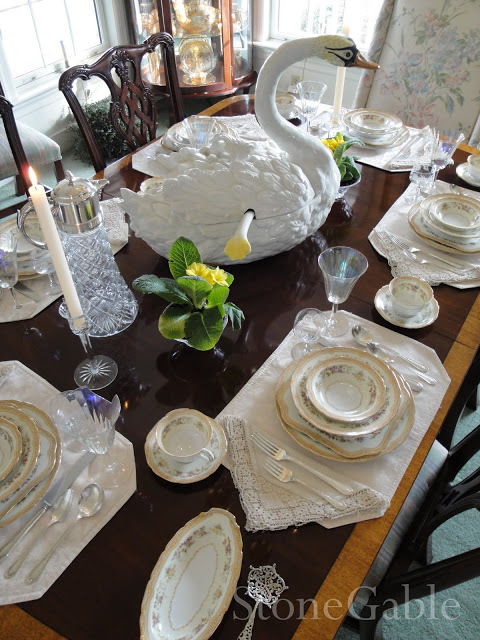 The swan is amazing, the crystal, the china, even the primroses. Just amazing. 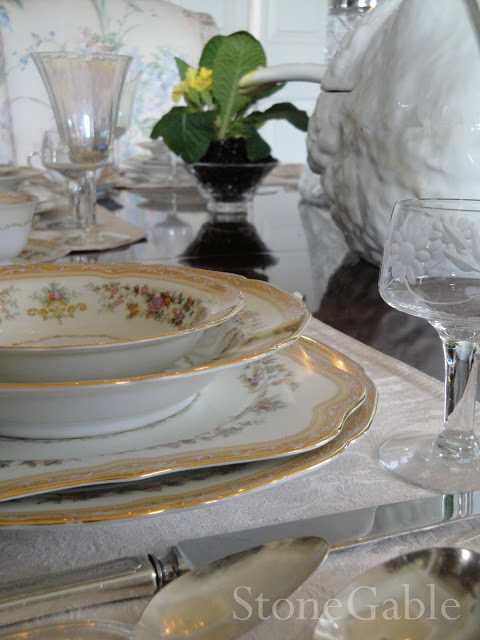 The plates and stemware hold so much love and history… one could only feel very honored to dine at this table. 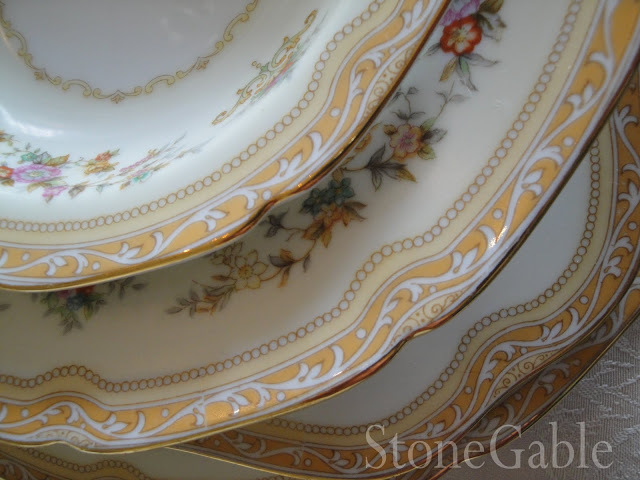 That china is amazing and you have so many fabulous pieces of it! Gorgeous. I really enjoyed all the touches on this great table you put together!! Oh, this is so gorgeous! The swan is just breathtaking, and you china is stunning. I love the linens you’ve used too. Thanks for sharing and happy TT to you! This table is just absolutely stunning! Love all the pieces that you put together to create it. I do have to say that the swan is my favorite though. Such a regal piece that demands attention. The linen is beautiful and delicate. The story behind all the pieces are wonderful. Love everything! But then again, what don’t you do that I don’t drool over?! I can’t wait to see what you think of the recipe tomorrow. I have been on pins and needles hoping that it is worthy of you! Stunning! Just beautiful. I have a swan soup tureen but she is nestled in where this one us just reaching his neck out. 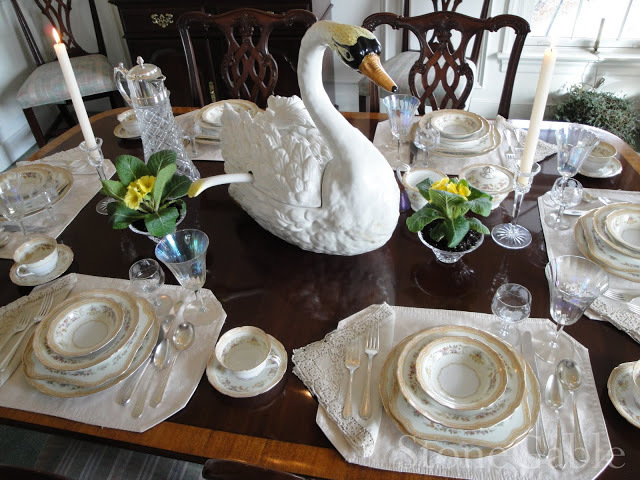 I can never think of a good table setting with my swan, your is just incredible.